I bought this book on my Kindle yesterday and finished it in one day, it was that good. 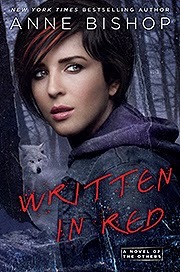 "Written In Red" by Anne Bishop, is an adventure ride through a world where humans and "Others" live together. This is unlike any paranormal story, that you have ever read before. Plus, the cover is so beautiful that it drew me in just to read the summary. Shape-shifter Simon Wolfgard is reluctant to hire the stranger who inquires about the Human Liaison job. First, he senses she’s keeping a secret, and second, she doesn’t smell like human prey. Yet a stronger instinct propels him to give Meg the job. And when he learns the truth about Meg and that she’s wanted by the government, he’ll have to decide if she’s worth the fight between humans and the Others that will surely follow." Meg is a blood prophet, who has escaped from enslavement. She doesn't know much of the world but knows that she has to keep who she is and where she came from a secret. Simon is a Wolf, who doesn't trust humans and thinks of them only has meat. When a human comes into his store, freezing and not smelling like prey he is curious about this crazy human. He decides to give her a job and can't fathom why he doesn't want to eat her. When the people, who are chasing Meg, find her and bring trouble to the Courtyard, Simon and the Others have to figure out if they are going to protect her or hand her over. This is such an amazing read that it will keep you intrigued until the very end. It will throw some twists and turns in there, but it is such an amazing story, that you can kind of figure out what will happen. You will fall in love with the characters and be rooting for Simon and Meg to end up together. There are some very descriptive death scenes, so if you have a weak stomach, this book isn't going to be for you. If you can stand blood and gore, than please give this book a chance and you won't be disappointed.